To further enhance our ever popular profiling of Irish surnames we’ve decided to move the fearure to our blog and allow for better and improved user interaction and feedback. Taking the spotlight today is the name Sheehan or Sheahan. The popular name Sheehan or Sheahan, often referred to in the USA as Sheen or Shean, is the anglicisation of the Irish Ó Siodhacháin, from a diminutive of siodhach, meaning ‘peaceful’. The eponymous ancestor of the family is disputed, but must have been unique among the Irish of the day to have deserved the description “peace maker”. Not every scholar accepts this origin of the name, but given the fact that the sept’s traditional coat of arms features a dove of peace, there will be few of the name who will want to consider any alternative. One ancient genealogy places the sept’s ancestor as a brother of Brian Boru while another has him as a member of the Scanlan sept. The Book of Leinster refers to “Muintir Sidechain” from a distant relative of Brian Boru. Cormac Cas was King of Thomond (Tuathmhumhan, modern county Clare with adjacent parts of Limerick and Tipperary) around the fifth century and he spawned a tribal grouping known as the Dál gCais or Dalcassians which dominated Munster until the final suppression of the old Gaelic order in the seventeenth century. Their most famous family is that of O’Brien, but the group includes other well known families such as McNamara, O’Grady, Heffernan, McMahon, Hickey, Clancy, etc. Regardless of the precise identity of their ancestor, the sept of Ó Siodhacháin is believed by most authorities to be part of the Dál gCais, having a chief residence in Lower Connello, Co. Limerick. O’Sheehan, O’Meehan and O’Cullane all served as chiefs in that barony. Over the centuries, however, the members of the sept migrated southwards and in modern times the name is most common in County Cork, though also found in Kerry(profiled in our top 10 places to visit in Ireland) and Limerick. The name starts to appear regularly in the records of Cork from the fourteenth century mentioned in connection with Kilcredan parish in the diocese of Cloyne on several occasions. We find John Shyghan of Youghal who was a tailor there in 1617. In the same town we find William Sheehan as town clerk in 1688. We also find one Thadeus O’Sheaghan as a Church of Ireland Vicar of Inchigeelagh in 1639. In 1689 we find one Capt. William Sheehan in King James army list. Add your suggestions for next month through our comments below. This entry was posted in Irish Genealogy, Irish Surnames and tagged Irish Genealogy, Irish Surnames, sheahan, shean, sheehan, sheehan coat of arms, sheen. Bookmark the permalink. My husband says our last name is Irish… is it? I read somewhere that McFarlane is Irish and McFarland is Scottish. If you could shed some light on this I would most appreciate it! I will have to research this for you and get back. All I have found so far is a post on answers.com which says it’s origing is in Northern Ireland – not much info though. The following will hopefully answer some of your questions and I will keep you posted if I find more. Great to hear from a Sheehan and hopefully our readers will enjoy your website. My grandfather was a Curtin from Lima,Ohio nd his family came from Ireland during famine years, I believe. I will check with my colleagues and get back to you asap on this – thanks for asking the question. Hi.I know that my surname Ray has Scottish,English and French origins.I also know that it has Irish origins too but I just don’t know exactly where (Ulster,maybe??) 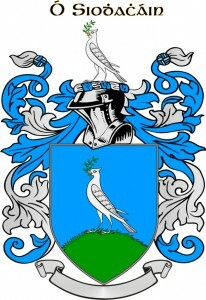 I am eager to find the Irish history of the Ray surname but it is impossible to find anywhere.I am told that there is also an Irish coat of arms for the surname Ray.I’ve seen the Scottish,English and French ones,but never the Irish one.Can you please help me with this?I’d really appreciate it.Regards,Jason Ray(Séasán Ó Riabhaigh). I’m in about the same situation. Maybe we can help each other out. Go on Irishtimes.com and type in our last name. I am descended from the Clancy’s of County Clare………..looking forward to visiting for the first time in May 2011.
will be coming to Ireland in the near future, for a long stay and tour, found this surname site. My name seems to a jumble is it Irish ,English, or a combination of the both? thanks loads it is most intersting already the amount of information is great and very easy to acquire, thanks Tom S.
I have recently started to trace my Irish roots and find it thoroughly fascinating. I am very impressed with your site and intend to use it significantly in my future quest. Hi! I am from Peru (South America) and my last name is also Sheen. I am very glad to know that they are more Sheen or Shehan around the world. It is woderful! Please research “Breen” since the DNA info received from Ancestry.com didn’t help much and most of my relatives are gone. I have just done a Family Tree DNA Family Finder Test. It is above my head but I hope when I get back the test in the next four to six weeks that I will have some information. I am up against a brick wall trying to find the location in Co Cork that my G Grandmother came from. She was Catherine Breen DOB 1824/1834 approx from Kilbrin or Boherbue Co Cork area. Interesting to hear someone using DNA to link families. I had my DNA done some years ago- if you have info on Breen DNA I would like to check it against my own. My Breens originated in Co.Kerry, Ireland. My surname is Sheahan. What is the difference between Sheehan and Sheahan?